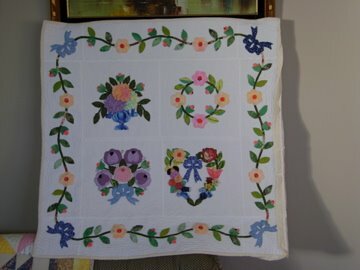 I haven't been doing much quilting but I have been sewing. 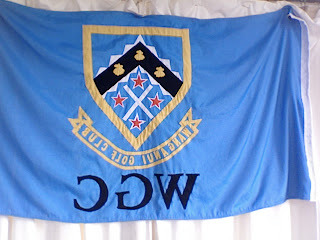 Here is a photo of the golf clubs new flag. I have been sewing the emblem on to it. It is all finished now just in time for the Masters Games. Sorry about the flag looking backwards but I had to take the photo with my computer camera as the digital camera was away with DH. The emblem is on both sides of the flag. So I had to sew both pieces on at the same time. I only had to unpick one of the white stars as I hadn't position the underneath piece of fabric correctly. Glad it was the only one as each pieces is satin stitched on. I am not very patient with unpicking.